On the way, she's trying to bring Mainers along, at least in spirit. University of Maine graduate student Anna McGinn is gearing up for her fifth trip to the United Nations’ climate change negotiations, the annual gathering of world leaders that in 2015 led to the Paris Accord, a global agreement on taking measures to combat climate change. This time around, the meetings are in Poland. But before McGinn heads overseas, she’s bringing simulations of the meeting to students throughout Maine and hoping to bring some of them along virtually. We talked to McGinn about her experiences at these worldwide conference and how she is helping Maine students channel the needs of both far-flung countries and their own. FOLLOW YOU ANYWHERE: The University of Maine’s 4-H program runs a “Follow a Researcher” program to connect communities to the work being done by student researchers at the university. McGinn is part of that, and she and her fellow graduate student, Will Kochtitzky, will be followed via video when they go to Poland. 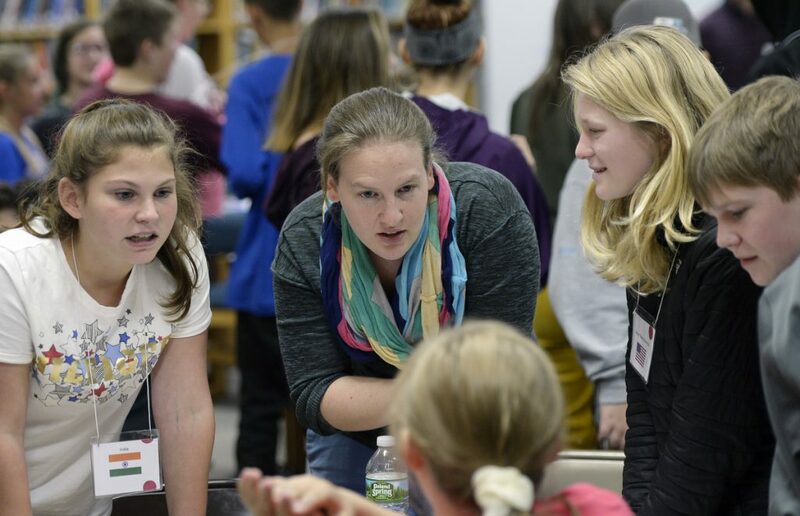 They also do school and community visits to run climate change negotiations simulations, including one earlier this year at a meeting of the Maine Science Teachers Association. We caught up with McGinn as she was preparing for the youngest group she’s worked with yet, a seventh-grade class in Old Orchard Beach. She’s got 11 more scheduled between now and May. HEAD OF THE CLASS: McGinn is in the third (“and final!”) year of a dual master’s program. Her degrees will be in Climate and Quaternary Studies, administered through the Climate Change Institute at the University of Maine Orono, and in Global Policy through the School of Policy and International Affairs. (Quaternary refers to the most recent geologic epoch, FYI.) McGinn did her undergraduate work at Dickinson College in Pennsylvania. The Massachusetts native was drawn to the University of Maine because of the Climate Change Institute. WE’LL ALWAYS HAVE PARIS: The first international climate change negotiation McGinn attended was in 2011, in Durban, South Africa. She attended with other Dickinson students and had to go through a yearlong accreditation process just to be an observer. In 2015, she signed on for the Paris conference, where the big treaty was hammered out. “I really wanted to go because that was the anticipated outcome.” How do you get a room in Paris when there are 30,000 extra people in town for a mega-treaty negotiation? “That year I stayed at a hostel.” Which was fun. “There were lots of different young people from around the world.” In 2016, she traveled to Morocco, for the conference in Marrakech, attending with other Dickinson alumni and last year attended the conference in Bonn, Germany.